Guys, the freshman 15 is so real. Food is huge here, but honestly, do you really want to go to a school where it isn't? Maybe it's because its a college town, but Gainesville seems to be home to every innovative food business in the country. Maybe it's because the dining halls are just that bad. Either way, Archer Road, one of the four main roads in Gainesville, houses just about every chain restaurant you could ever think of. You'll find food you'll drool over by digging just a little deeper into the Gainseville culture. Does this really need an explanation? Gainesville pizza is so good it managed to make it’s way onto Buzzfeed’s list of pizza places to try before you die. 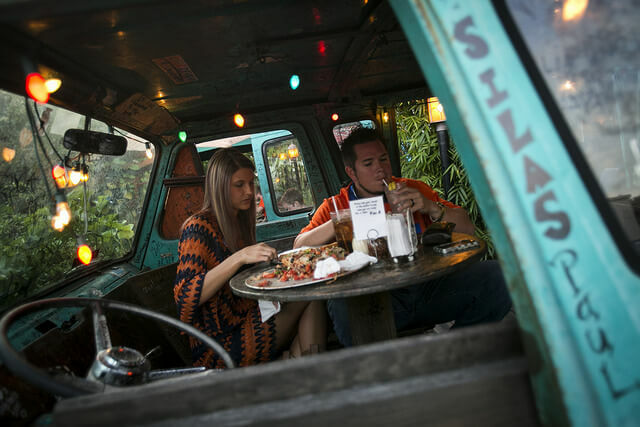 Pizza is a staple in college life, and there are a handful of eateries in Gainesville for every occasion that calls for carbs. Go to Leonardo’s By the Slice for a fast and cheap meal, but mainly for their infamous doughy rolls and garlic butter. Try Satchel’s for the super hipster experience, Blue Highway for creative wood-fired pizzas, Gumby’s for greasy and gluttonous Pokey Sticks (cheese bread) and Pizza By the Slice for the perfect nightcap in Midtown. Most people think of Gainesville as a suburb in the middle of nowhere, so it comes as a surprise that it’s home to more than just its beloved gators – there’s also its beloved brunch. Whether its Bagels and Noodles, Bagels Unlimited, 43rd Street Deli, Flying Biscuit, Sister’s or Peach Valley, there’s a solution to satisfying your hangover. Each of the breakfast options in Gainesville has virtually the same menu with varying wait times. The worst is usually Flying Biscuit; so if you’re in the mood for some classic southern grits and biscuits, make sure to wake up early. So your parents are in town and ready to force-feed you because you look “too skinny.” Enter Dragonfly – the holy grail of sushi. It’s definitely on the pricier side, but it’s 100 percent worth it. 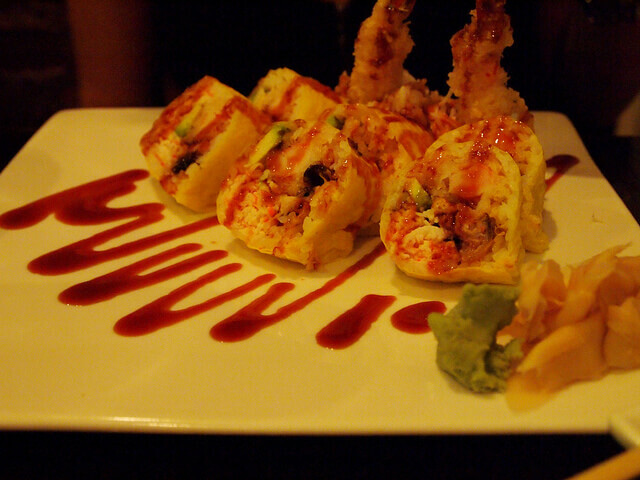 Each dish has an incredibly rich and unique taste, and all of the sushi is inventive and original. Make sure to explore the downtown area while you’re there, and stop by the Hyppo for the weirdest combination of Popsicle flavors you’ve ever had. Acceptable pretty much only if you're a freshman with limited options. Even then, maybe you should just cook for yourself. It might sound a little bit dramatic, but honestly, the dining halls always have the weirdest options, and for some reason everything is spicy. Even the salad dressing. You'll find yourself eating an overabundance of desserts, ice cream and cereal at all times of the day, and trust us, it gets old fast. Others with a meal plan choose the fast food options of food courts at the Reitz Union and The Hub, offering Subway, Jamba Juice, Einsteins, Chick-fil-a, Wendy's and more. If you do decide to brave on-campus dining, here's the drill. Better known as the place you ate at during preview where your parents raved about the diverse options. Surprise! All that gourmet food the school shovels out during preview is a show; you'll probably never find most of it at Broward Dining again. However, Broward Dining is known to have the best options available out of all the dining halls. Make sure to time your meals efficiently, as oftentimes, the line to get into Broward Dining is out the door and around the corner. Most importantly: yes, those cookies count as calories and no, they're not an acceptable meal. What's kind of cool is that because this is the closest dining hall to the athletic facilities, you're likely to spot a Gator athlete here. Other than that, Gator Corner is pretty much the same as Broward, it just has less options. What's nice is that admist all of the weird dishes and small portions, you can always count on the sandwich station to be up and running. It has a setup similar to Subway, and the chefs (assuming they're in a good mood) will make you whatever you request, and even offer to grill the sandwich. Keep in mind that the menu online isn't always as promising as it sounds. Just because the menu boasts chicken nuggets and french fries, doesn't mean they won't run out within the first hour of being open.